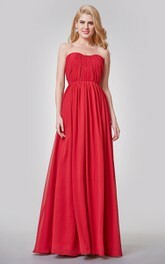 Tiered layers of chiffon that part in the middle at the natural waist give this dress an ethereal quality. 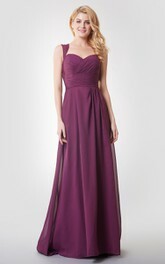 Criss-cross ruching on the strapless, sweetheart bodice keeps the A-line, knee-length dress contemporary and grounded. FITS GREAT. LOVE IT. 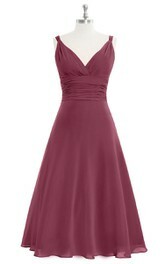 IT REALLY IS A LOVELY DRESS. 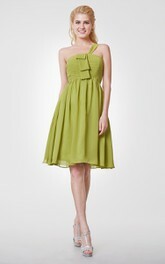 I ordered this dress for my mother to wear it on her wedding. she was very pleased after receiving the dress. she looks wonderful in it and keeps on thanking me again and again. So now I am writing a thank you note to you. This online store has made shopping very easy for busy people like me. 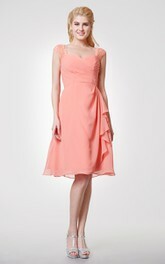 When I saw this dress, I realized this is the dress for which I was longing for. 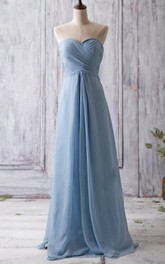 I am totally in love with the dress. the color is just magnificent and the fabric is outstanding. 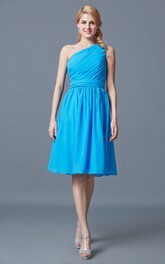 The custom made dress really fits me and I am going to recommend the dress to my friends also.